Chart Explainer is software that automatically generates fluent textual summaries of certain types of charts, graphs and tables. 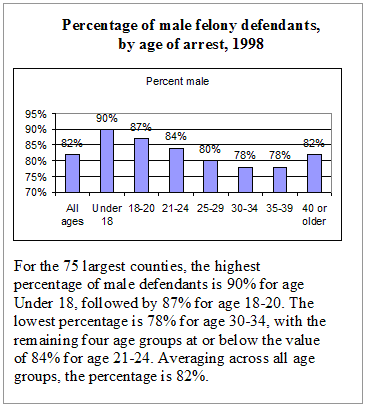 The bar chart below is based on data from the web site of the Bureau of Justice Statistics. The paragraph below the chart is generated by Chart Explainer. What is the purpose of Chart Explainer? Chart Explainer is designed to make the information in a chart or table more accessible to anyone, but particularly to visually impaired users, who may not be able to read graphical charts at all. Textual summaries highlight the most important information in the chart or table, which is not always easy to find, even if you can read the raw numbers. What makes Chart Explainer better than existing technology? For visually impaired people using screen-reading software, it can be difficult and time-consuming to scan data tables to get an overview of the data. The same goes for automatically generated 'blow-by-blow' listings of data points on a chart. Although such detailed examination of the data may be warranted in some situations, Chart Explainer complements these methods of data access by making it easier to zoom in on the part of the data that is most interesting. From the perspective of a data provider, Chart Explainer allows you to offer high-quality textual summaries of your data, with much less effort and greater consistency than if you were to write the summaries by hand. How does Chart Explainer work? Using Chart Explainer is like using a chart-drawing tool. With a chart tool, you give it some data, it generates a chart, and you set various options to customize the appearance of the chart. With Chart Explainer, the process is the same, except that it is generating paragraphs of text instead of colored bars. And instead of configuring visual elements like legends or bar color, you are configuring certain key phrases to describe your data, and thresholds that control the length of the description. What format does my data need to be in to use Chart Explainer? Generally speaking, Chart Explainer requires the same sort of data that a chart-drawing tool would require - Chart Explainer will not automatically structure your data or perform calculations for you, but if you have enough structure in your data to draw a chart, you can use Chart Explainer on it. Chart Explainer's user interface will allow you to specify the structure of your dataset, including the number of series, whether totals are shown, etc., and specify options such as the display format for currency values. How do I use Chart Explainer? Chart Explainer's user interface lets you load and configure a dataset, then customize the textual summary interactively, using simple point-and-click operations. The customizable parts of the summary, such as variable names, are highlighted so that you can click to edit them, as shown below. Chart Explainer can also be used in two modes, static and dynamic. In static mode, for data that will not change, you simply load a dataset, generate a summary, and copy the resulting text to another document or web page. In dynamic mode, for data that changes constantly, you can configure the phrasing and other options appropriately for your dataset, then have Chart Explainer operate in a dynamic server mode, to generate summaries on demand that always reflect the most current data. What kinds of charts/tables can it handle? Chart Explainer covers two main conceptual types of charts, categorical and time series. Categorical charts include popular types such as bar charts, column charts, and pie charts. Time series are usually displayed as line charts. Chart Explainer can also work with data displayed in certain types of tables, where typically data series are displayed as columns, and rows represent either categories or time points. Future versions will support the full range of features normally supported by OLAP tools, including hierarchically structured data dimensions - for example, multi-level category breakdowns such as country/state/region/zip code or year/quarter/month.